I first made these cookies (and froze a huge batch) while I was waiting for Baby to make her appearance. 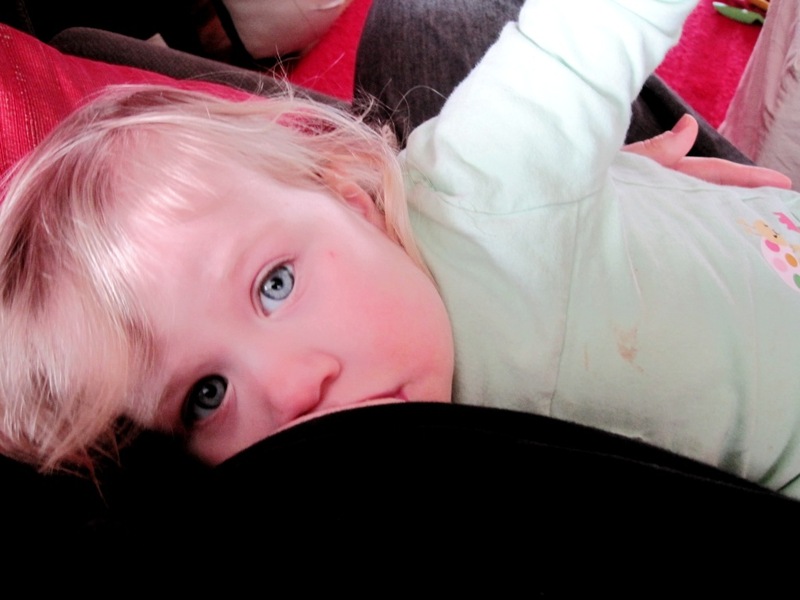 I was already on maternity leave, but she was “late,” taking her time, getting ready for the world. Once she was here, they provided me with nourishment in the middle of the night while I was providing her with hers; breastfeeding builds up an appetite. More recently I made them with Baby in the carrier. 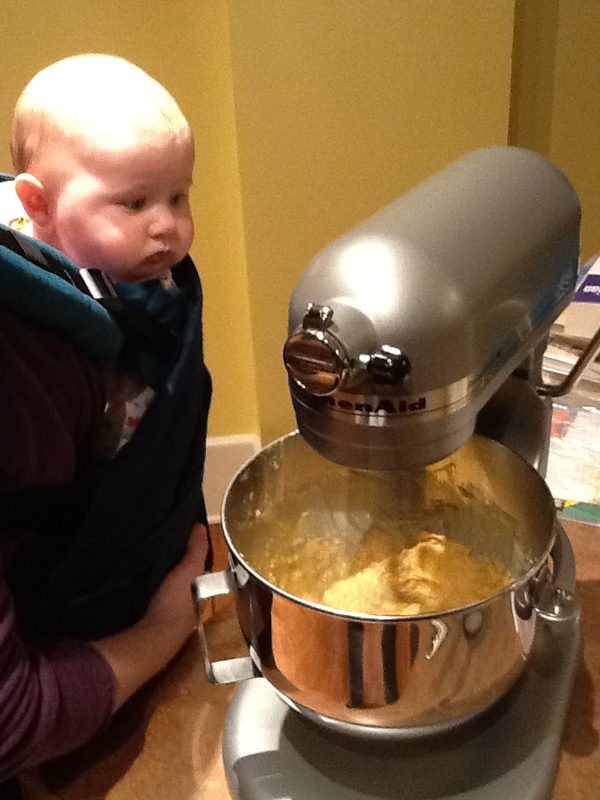 She’s so curious, looking from the mixer button to the bowl, watching the beater turn. 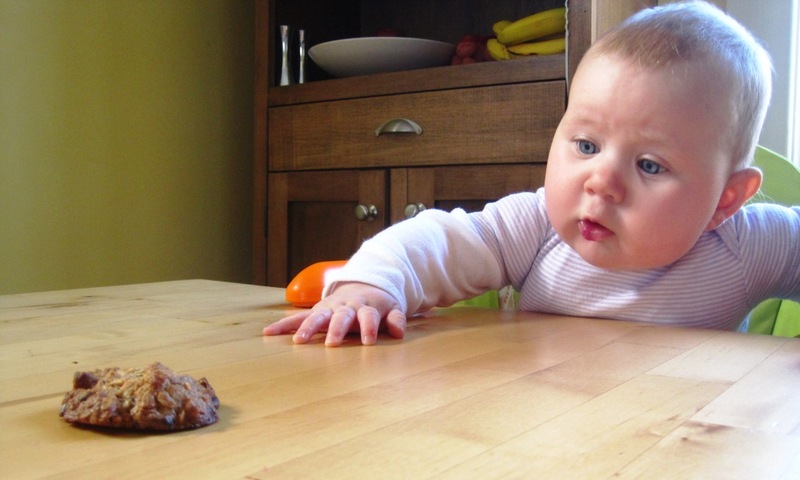 Soon enough she’ll be taking her first bites and eventually be able to eat one of these cookies herself. And we’ll continue to bake them together. I look forward to that day! I wanted to name these cookies after my baby. But to preserve our privacy, I opted for “6A” instead. 6 As like in her complete name. 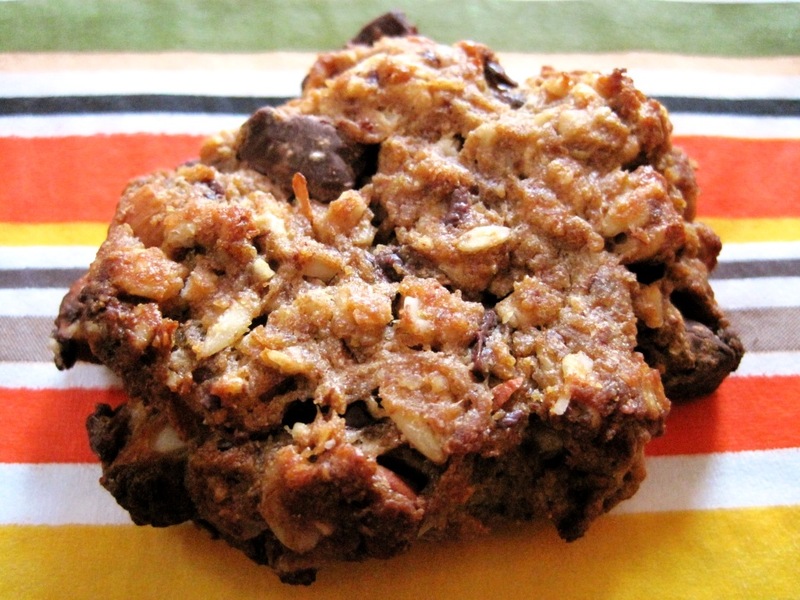 6 As like all the good ingredients in these cookies. Tasty little nuggets of nourishment. This recipe is adapted from the Bon Appétit cookbook’s Oatmeal cookies with raisins, dates, and walnuts. They freeze well. Makes approx. 30 cookies. In a bowl, combine flour, baking powder and salt. Using a standing or hand mixer, cream the butter and sugar until light and fluffy. Scrape down the sides of the bowl and make sure everything is well combined. Incorporate egg on low speed, then beat in honey and vanilla and continue beating until light and fluffy. Add flour mixture and beat on low speed until combined. 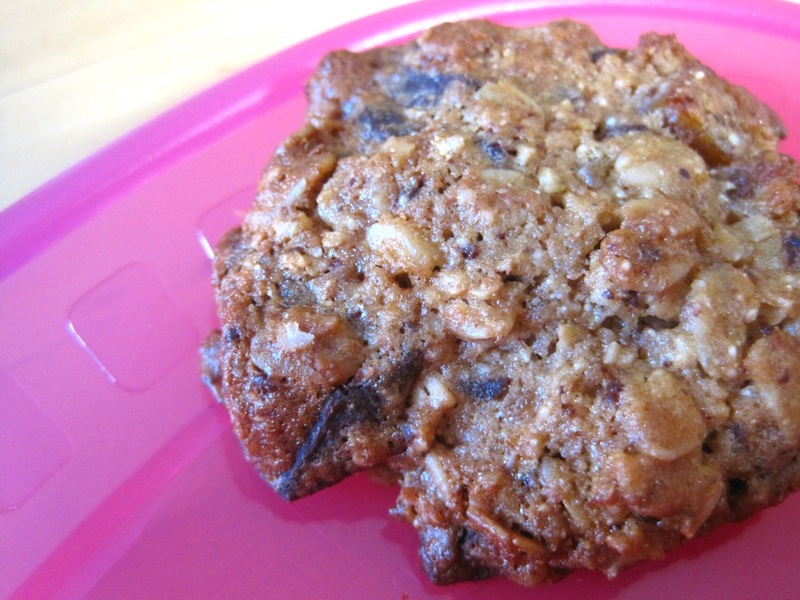 Finally, mix in oats, chocolate chips, walnuts and pear pieces/dried cranberries. Drop batter by tablespoonful onto prepared cookie sheets. Moisten fingertips and flatten cookies slightly. Bake approx. 10 minutes until golden brown. Sorry Baby, I shouldn't have tempted you, but you'll get to eat one soon enough. I finally started the Christmas baking. With Baby in the picture this year, I had to make some tough decisions: which cookies to bake. Most of my regular recipes, including most favourites, are staying on the shelf. 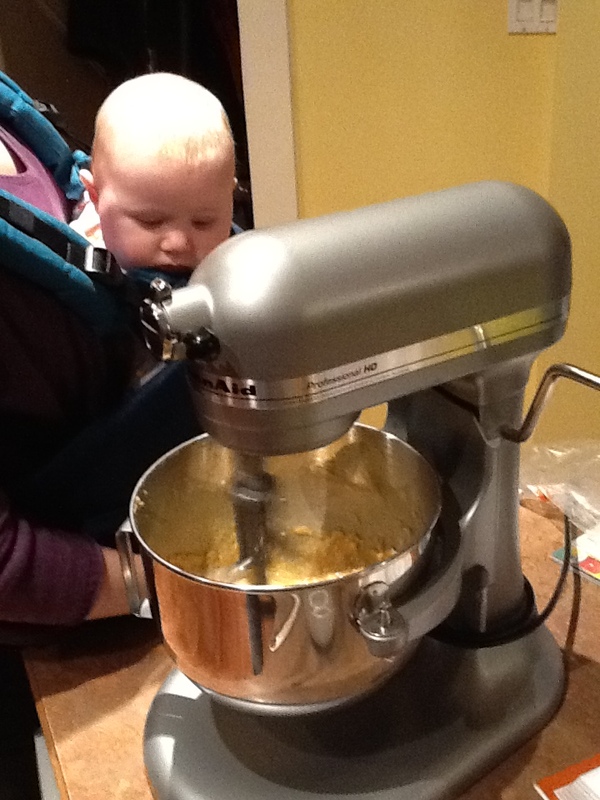 The cookie cutters too will gather dust until I’ve got a little helper in the kitchen next year. [Anyone with kids is certainly laughing at my naivete and thinking, “You wait and see. Your little helper will just help make a big mess!”] Luckily Basler Leckerli, one of my favourite Christmas cookie recipes, is quick to make and makes lots of cookies with little effort. Basler Leckerli date back to the 17th century. At the time, making gingerbread was a recognized trade. 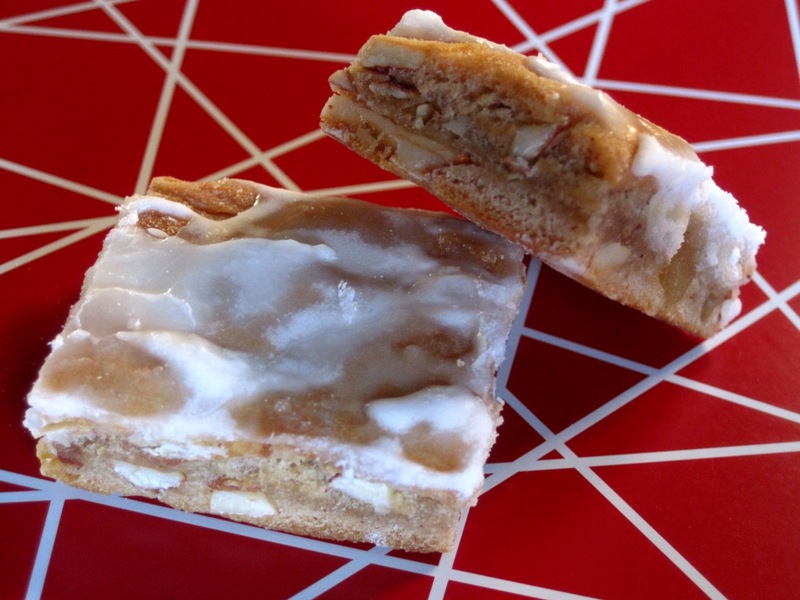 The use of roughly chopped ingredients differentiated the gingerbread made in Basel from that made in other parts of Switzerland and Germany, where they were made with finely ground nuts. Go to Basel today and the tradition continues. Leckerli are available year-round from a local shop called Läckerli Huus (House of Läckerli), but I find homemade ones taste better! This recipe is from my mom and originates, of course, in her hometown of Basel, Switzerland. It contains neither fat nor eggs. The cookies are dense and wonderfully flavoured with honey, candied citrus peel, almonds and spices. Quantities in weight – scale required! 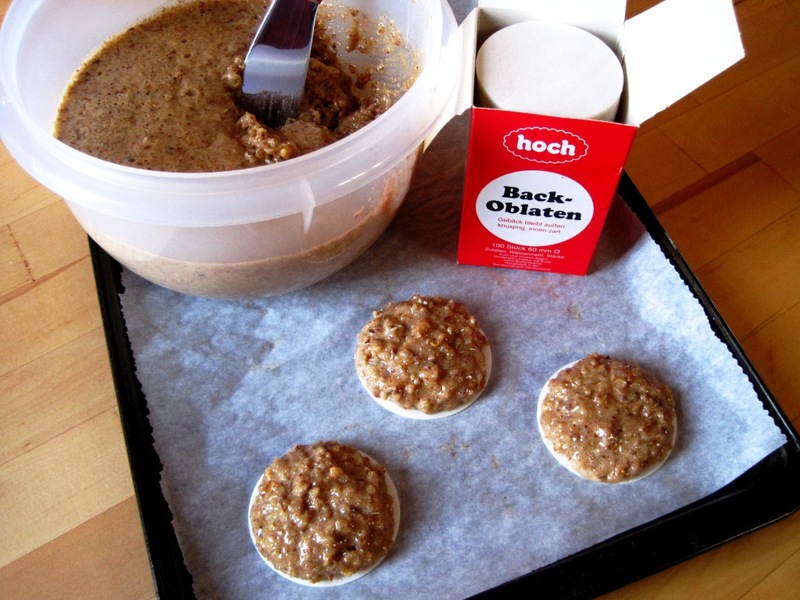 The honey and flour mixture for Basler Leckerli before rolling out. It’s quite sticky, but needs to be worked while still hot. Sprinkle with flour to prevent sticking. 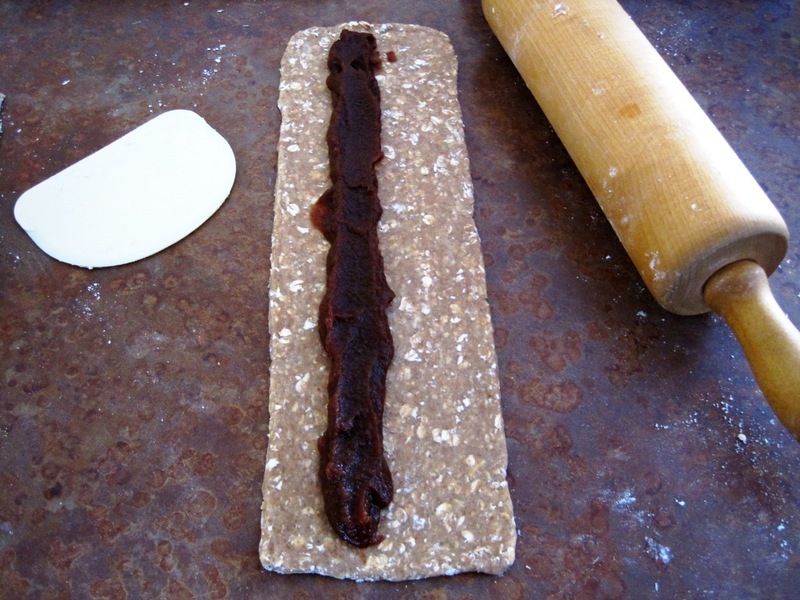 Basler Leckerli rolled out and ready for baking. 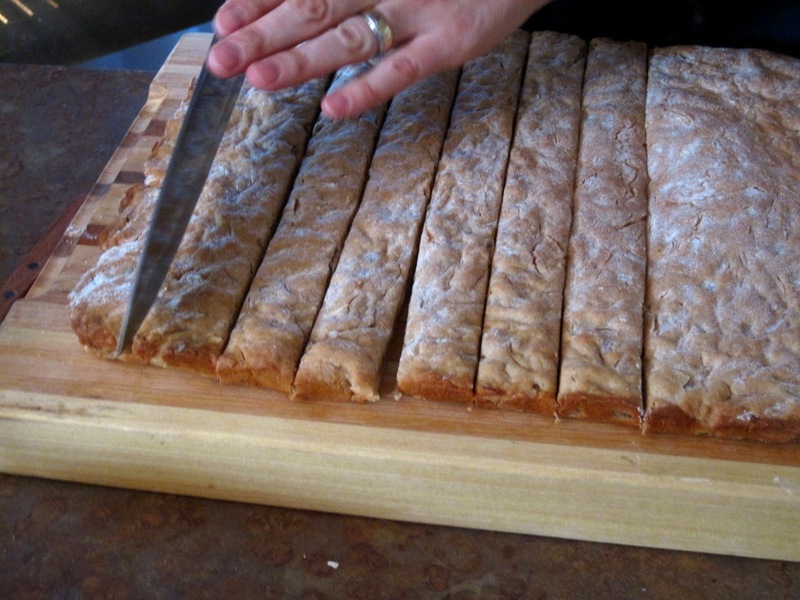 Working quickly to cut the baked Basler Leckerli while still hot. The glazed Basler Leckerli. Final step: let cool completely, separate and store in an airtight container. 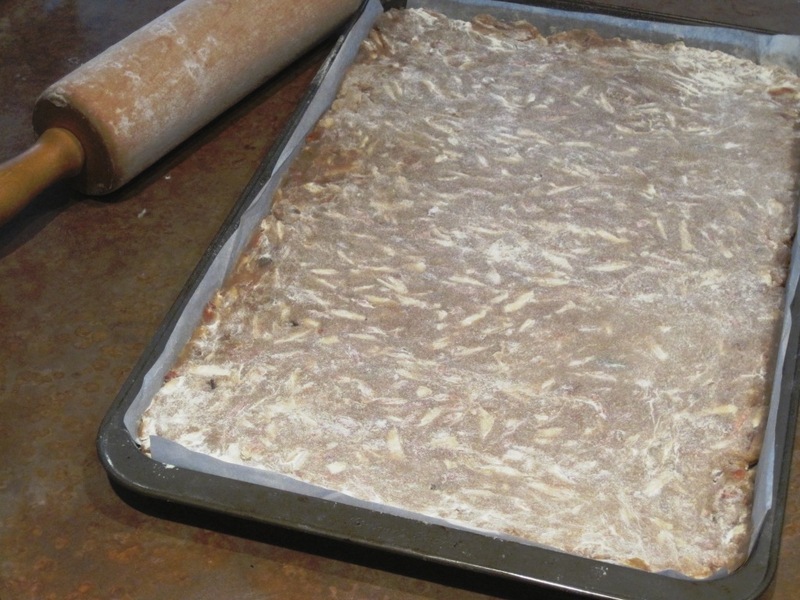 Preheat oven to 350° F. Prepare a baking sheet by lining it with parchment paper, greasing and flouring the paper. I also grease the baking sheet to prevent the paper from sliding around. In a large pot, bring honey and sugar to a boil. Add almonds and cook for 2-3 minutes. 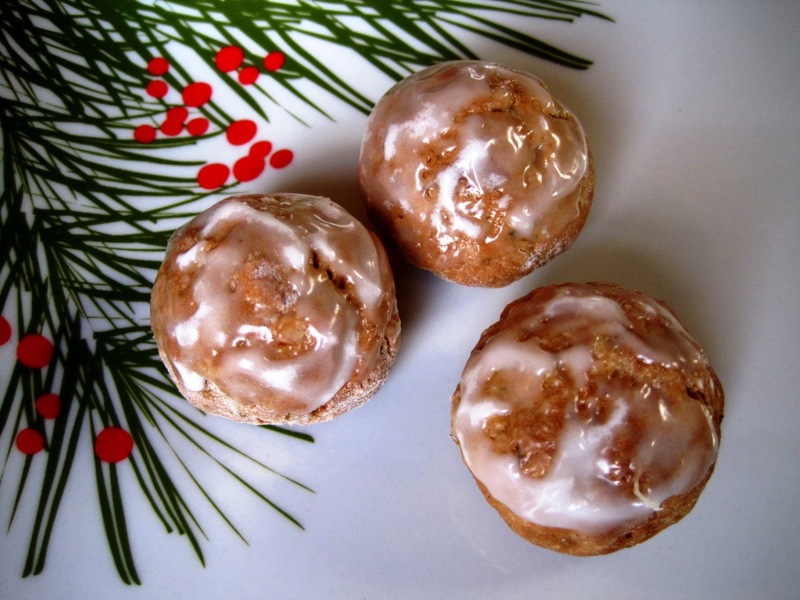 Remove from heat and quickly stir in rum, spices, candied lemon peel, and flour. Place honey and flour mixture on prepared baking sheet. Sprinkle liberally with flour to prevent mixture from sticking to rolling pin and roll out evenly. I find this step is easier done by two people: one person to hold the baking sheet and the second to roll out the dough. Bake 15-20 minutes until golden brown. Prepare glaze while cookies are in the oven. Mix rum, then water into icing sugar one tablespoon at a time. If necessary, add more water one teaspoon at a time to achieve the right consistency. The glaze should be very thick. 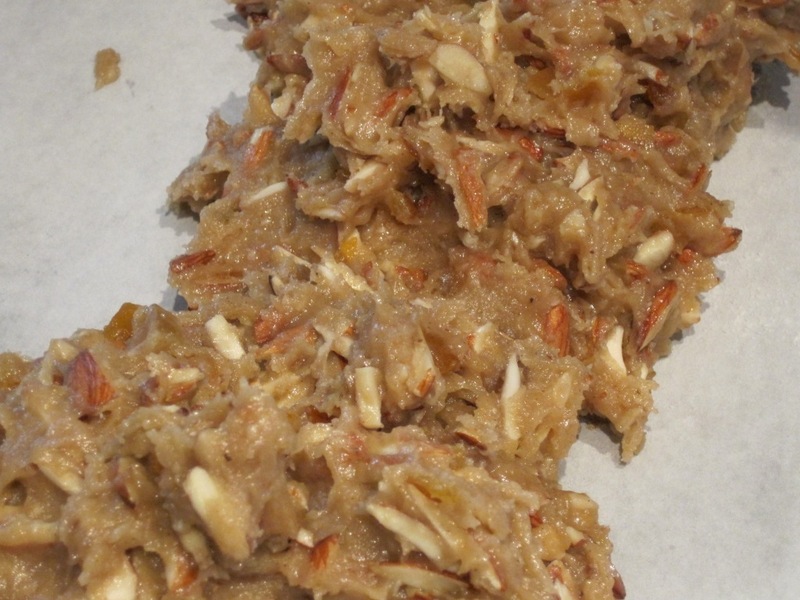 Remove cookies from oven and slide onto cutting board. Cut immediately into squares/rectangles and glaze while still hot. I find the best way to spread the glaze is to use a metal spatula; spoon the glaze onto cut cookies in sections and spread quickly with the spatula. Doing this step with two people can make sure that the glaze gets on before the cookies are too cool for it to spread nicely. These cookies store for a long time in an airtight container. It’s not unusual for them to be/get a bit hard. Either leave them like that and bite carefully (great for dunking in tea or coffee) or put piece of bread in the container to soften them up. 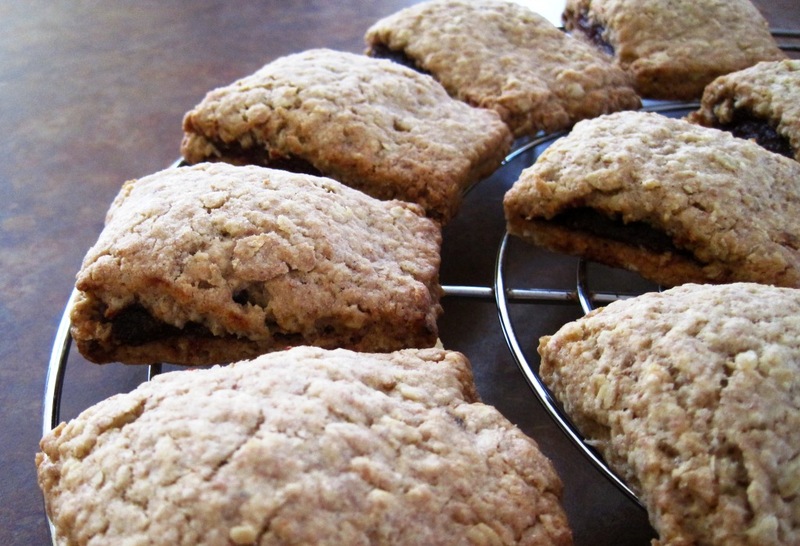 The Harvest Loaf Bakery used to make Cape Breton oat cakes and a date-filled version. They were one of my favourite treats. About a year ago, they disappeared from the shelves. A couple of weekends ago, I finally asked if the bakery still made them and was disappointed to discover that it doesn’t anymore. Unfortunately the baker with the recipe left and it was unable to reproduce it faithfully. For a while now, I’ve wanted to try to make them in my own kitchen. It was this recently tweeted recipe that finally encouraged me to make them. The blog post talks about how the recipe was demonstrated at the South Arm Community Centre in Richmond, B.C.. This was my neighbourhood community centre when I was growing up; I went to playschool and brownies there. What a coincidence! After comparing several oat cake recipes, I made three different batches in the last couple of weeks – brown sugar vs. white sugar, variations on the date filling, more butter vs. less butter, hand mixed vs. food processor – and had them taste-tested by several people. The only thing I didn’t try is to make them with shortening; I’m just not a fan. Below is my favourite version. It has less butter than any of the recipes to which I referred. The dough may seem a bit crumbly, but it rolls out fine. The lemon in the filling brightens it and makes it a touch less sweet. I admit, I’ve never been to Cape Breton. No clue if this recipe is authentic, hence the “wannabe” status! Prepare date filling. Place dates and water in a small saucepan. Simmer over medium-low heat until dates are soft and water is reduced by half. Blend until smooth with an immersion blender. Mix in lemon zest and lemon juice. Set aside. In a large bowl, combine flour, oatmeal, sugar, baking soda and spices. Cut in the butter. Rub mixture between fingers until it resembles a coarse meal. Add enough water to moisten and gather dough into a ball. Work with a third of the dough at a time. Roll out thinly (approx. 1/8″) into a long, skinny rectangle. Spoon date filling onto the middle of one half of the rectangle. Wet edges with a bit of water. Fold other half over and gently but firmly seal the edges. 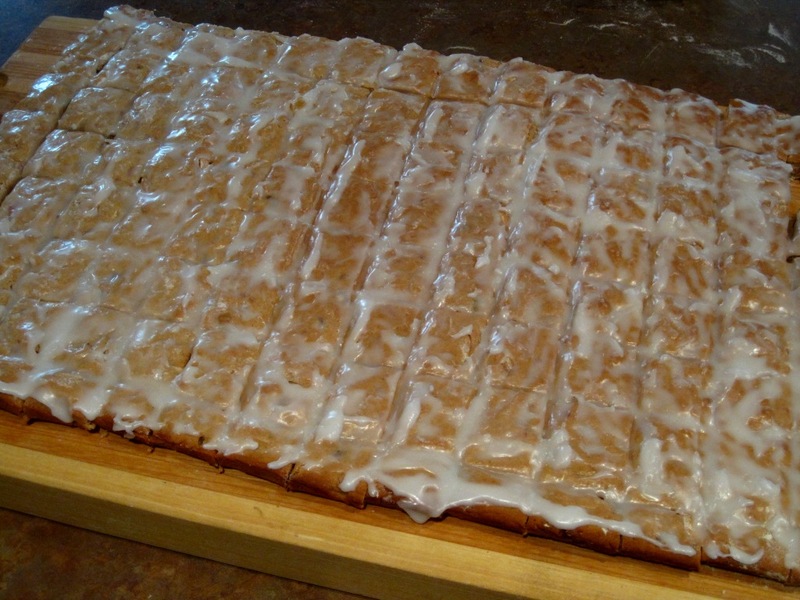 Cut into squares/bars and place on baking sheet. 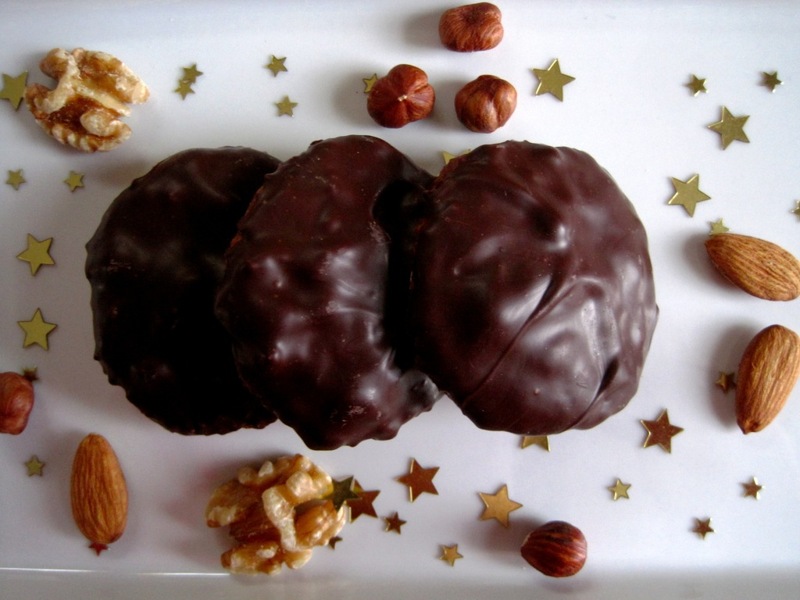 Chocolate Sparkle Cookies: Non-traditional or New Tradition? I spent much of last week preparing bags and tins of cookies and giving them away. My Christmas baking is pretty traditional. I make a bunch of cookies that are typical for the season in Switzerland and other parts of Europe. Some recipes are hundreds of years old! Except for one: Thomas Haas’s Chocolate Sparkle Cookie. Thomas Haas is a fourth generation pastry chef from Germany who set up shop in Vancouver. 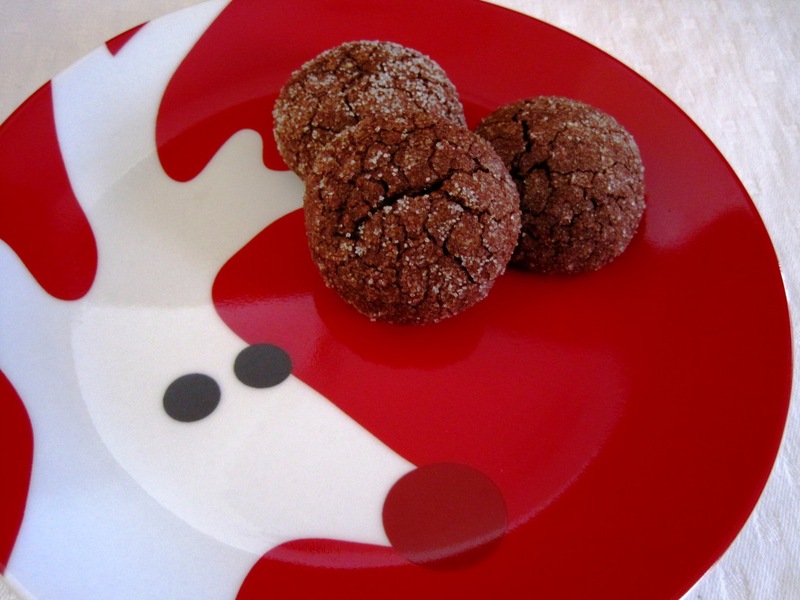 Around 2002, he created the Chocolate Sparkle Cookie, which became all the rage in Vancouver and beyond. My mom always has her ear to the ground for this kind of thing, and she is the one who introduced me to the cookie. A delicious introduction indeed! I’m not sure yet if the Chocolate Sparkle Cookie falls into the non-traditional cookie category or is simply a new tradition. What I do know is that it’s one of the most popular cookies I bake every year! This cookie was created by Thomas Haas. He shared the recipe with the L.A. Times. It was subsequently reprinted in Western Living’s March 2004 issue. The dough must be refrigerated overnight. Makes approx. 36 cookies. This recipe is gluten-free! Ready to roll! Chocolate Sparkle Cookie dough after chilling overnight. A small ice cream scoop would probably work well to portion the balls. Rolling the Chocolate Sparkle Cookies in sugar. Work quickly! The warmer the dough, the stickier and more difficult to manage it gets. 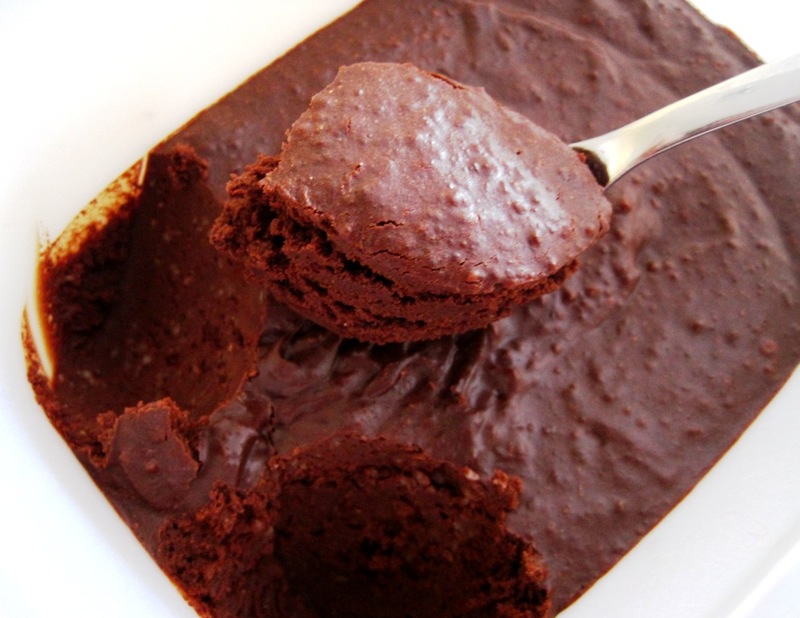 Combine the ground almonds, cocoa powder and salt in a bowl. Set aside. Melt the chocolate on top of a double boiler, over (but not in contact with) simmering water. Remove from heat. Mix butter pieces into the heated chocolate and stir until melted. Beat eggs with electric mixer, gradually adding the honey and sugar until light and the mixture falls in thick, smooth ribbons from the beaters (5-10 minutes). Fold egg mixture into chocolate-butter mixture. Gently add the ground almond mixture to the chocolate mixture. Cover and refrigerate overnight. Preheat oven to 325° F. Line a baking sheet with parchment paper. 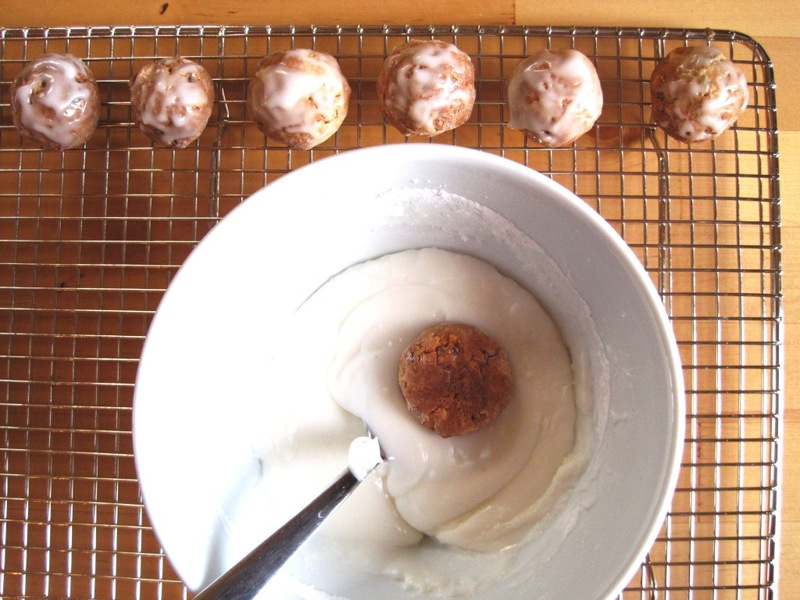 Form the dough into 1-inch (2.5 cm) balls. 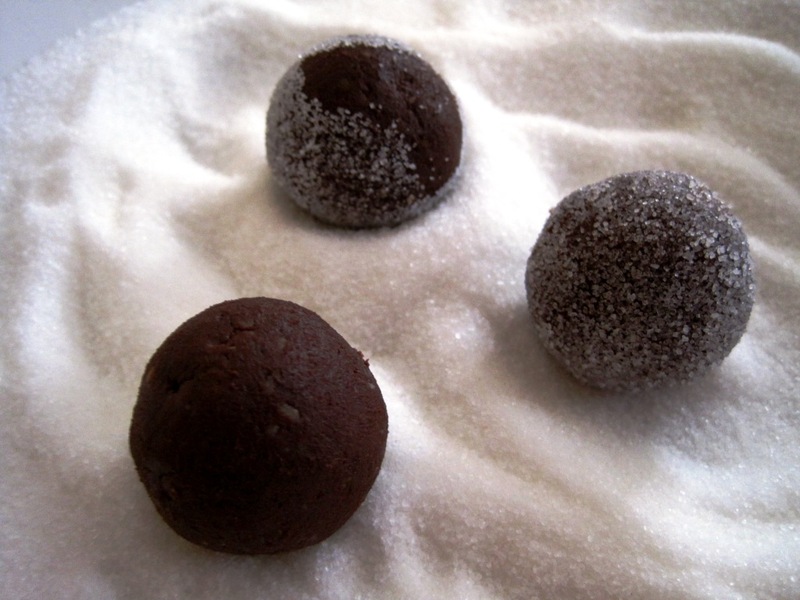 Working quickly, roll the balls in granulated sugar. Place on sheet about 2 inches (5 cm) apart. Bake for 12 minutes, until the cookies begin to crack and the centres are moist but not wet. Cool slightly. Dust lightly with powdered icing sugar. Pfeffernüsse were not part of my mom’s Christmas cookie repertoire. Yet, Pfeffernüsse are among my favourite Christmas cookies. Every year, I would eagerly anticipate receiving a tin of Christmas cookies from Trudi, a dear family friend. 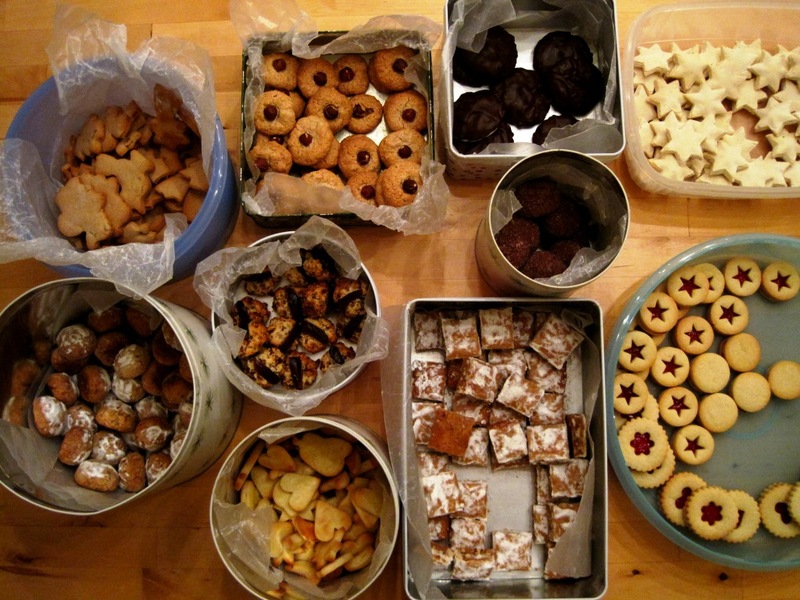 There were a lot of different cookies in that tin, but I always sought out the Pfeffernüsse. They were crunchy on the outside, tender on the inside, pleasantly peppery, with citrus-y and toasty goodness. There are a lot of Pfeffernüsse recipes out there, but in my opinion, none are as good as Trudi’s. I was delighted when she gave me her recipe. I haven’t had the opportunity to see Trudi and her husband Walter in a long time – there are several provinces between us – but I think of her every year when I make them. I hope she still making them and enjoying them in good health. Today I’m sharing this recipe at my mom’s request. Usually I’m the one getting cooking and baking tips from her. It’s rare to have it the other way around! Pfeffernüsse, ready to bake, after drying overnight. Letting them dry makes the outside crunchier, while the inside stays tender. I made a double recipe! Quantities in weight – scale required! This is the original recipe with my modifications in brackets. I’m a fan of spices, almonds and candied citrus peel, so I increase those quantities and reduce the sugar a little. These cookies have to dry overnight. Makes approx. 40 cookies. Preheat oven to 350° F. Prepare baking sheets (line with parchment paper). Combine flour, baking powder and spices in a bowl. Set aside. Chop almonds and candied citrus peel. Using a standing or hand mixer, beat eggs until light and airy. Add sugar and continue beating until the mixture forms a thick ribbon. Gently mix in flour, then the chopped almonds and candied citrus peel. 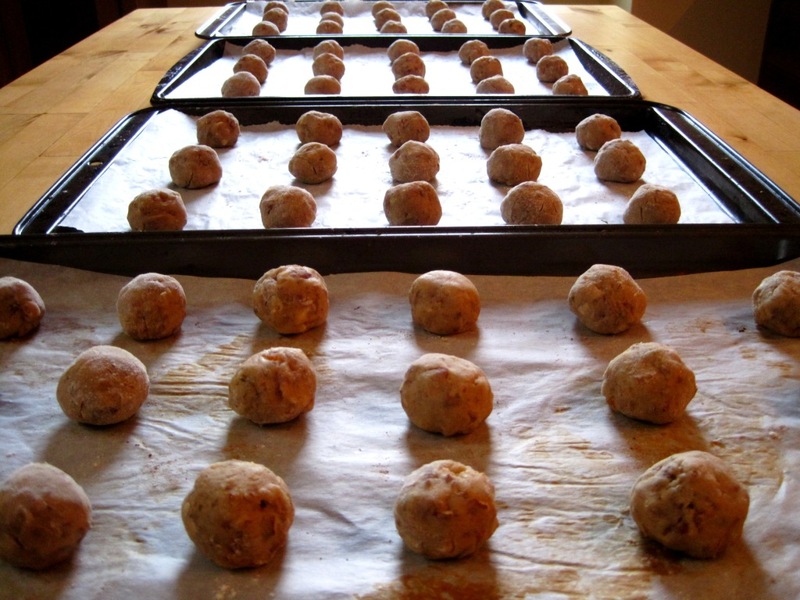 Form small balls with the dough and place them on the baking tray. The dough is still pretty moist, so I keep some flour nearby and dust my hands before making each ball. Allow to dry overnight or 12 hours. Prepare glaze before baking. Mix lemon juice into icing sugar one tablespoon at a time. If necessary, add more lemon juice one teaspoon at a time to achieve the right consistency. The glaze should be very thick. Bake cookies 15-20 minutes or until golden brown. Twirl and swirl the cookies in the glaze while they are still hot to get a textured glaze. I've never had any luck with brushes or the like; the glaze is too thick. Glaze the cookies as soon as they come out of the oven. The glaze is too thick to use a brush, so I just use my fingers to twirl the cookies upside down in the glaze. Set on a wire rack to cool. The glaze will harden as the cookies cool.